Data from the New Horizons flyby finished downloading to Earth in October, and while it will take many years for scientists to complete their inventory and model the results, early studies offer intriguing hints of its complex chemistry, perhaps even some form of pre-biological processes below Pluto's surface. Complex layers of organic haze; water ice mountains from some unknown geologic process; possible organics on the surface; and a liquid water ocean underneath—all of these features point to a world with much more vibrancy than scientists have long presumed. "The connection with astrobiology is immediate—it's right there in front of your face. You see organic materials, water and energy," said Michael Summers, a planetary scientist on the New Horizons team who specializes in the structure and evolution of planetary atmospheres. Summers has co-authored two research papers on the topic, with the first, "The Photochemistry of Pluto's Atmosphere as Illuminated by New Horizons," published in the journal Icarus in September. 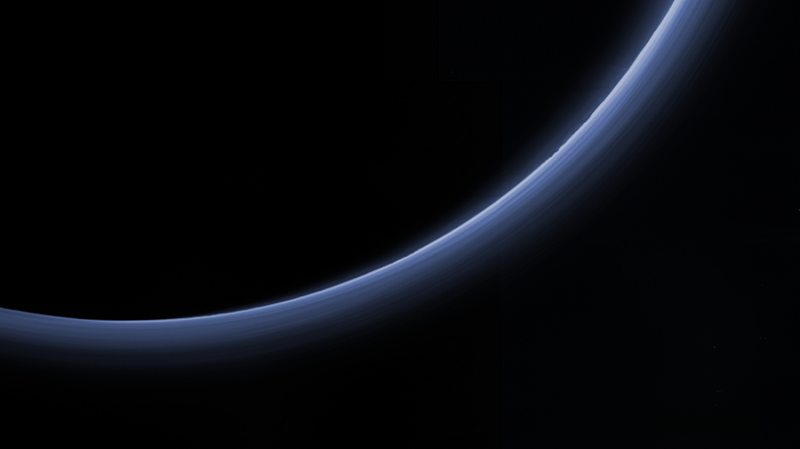 The second paper, "Constraints on the Microphysics of Pluto's Photochemical Haze from New Horizons Observations" is in press at the same journal. In first looking at the images of Pluto, Summers was reminded of a world he has studied for decades while working at George Mason University. Titan, an icy orange colored moon of Saturn, is the only moon in the Solar System with a substantial atmosphere and a liquid (methane) hydrological cycle. It has hydrocarbon chemistry, including ethane and methane lakes that have compounds that may be precursors to the chemistry required for life. NASA's Cassini spacecraft saw the same oddity in the highest reaches of Titan's atmosphere (the ionosphere) at about 500 to 600 kilometers above the surface (roughly 310 or 370 miles). Through modeling, scientists determined that the condensation is partially the result of Titan's photochemistry, whereby ultraviolet sunlight breaks down methane, triggering the formation of hydrocarbons. "This haze formation is initiated in the ionosphere, where there are electrically charged particles (electrons and ions)," Summers said. "The electrons attach to the hydrocarbons and make them stick together. They become very stable, and as they fall through the atmosphere they grow by other particles sticking to them. The bigger they are, the faster they fall. On Titan, as you go down in the atmosphere the haze particles get more numerous and much larger than on Pluto"
In retrospect, Summers said it shouldn't have been too much of a surprise that Pluto likely has the same process. Like Titan, it has a nitrogen atmosphere with methane as a minor component. The main difference, however, is Pluto's atmosphere is just 10 millibars at the surface, compared to Titan's 1.5 bar. (A bar is a metric unit of pressure, with 1 bar equal to 10,000 pascal units, or slightly less than the average atmospheric pressure on Earth at sea level.) The atmospheric pressure difference of the two bodies also affects the shape of the haze particles as Titan's particles taking much longer to fall to the surface and ultimately become spherical, while Pluto's haze particles fall more rapidly and grow into fractals. With the possible production of hydrocarbons and nitriles (another organic molecule) on Pluto, even more interesting pre- chemistry for life could take place, Summers said. "You can start building complex pre-biotic molecules," he said. An example is hydrogen cyanide, possibly a key molecule leading to prebiotic chemistry. What's also abundant on Titan are tholins, complex organic compounds created when the Sun's ultraviolet light strikes the haze particles. It's rare on Earth, but common on Titan and may have contributed to its orange color. There is also a reddish hue on parts of Pluto's surface, which could be from a layer of tholins, Summers said. His quick calculation estimates these tholins could be 10 to 30 meters thick, providing more organic material per square meter than a forest on Earth. This material may also change its chemical composition as cosmic rays (high-energy radiation particles) strike the surface. 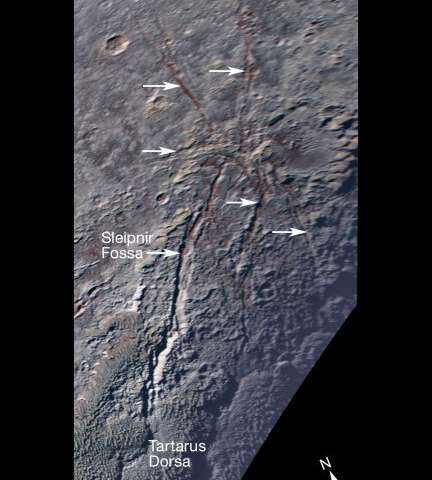 Intriguingly, reddish material was also spotted near Pluto's ice volcanoes, or calderas. It's possible that the dwarf planet could have a subsurface ocean similar to that suspected on Titan, Saturn's Enceladus and Jupiter's Europa. These moons, however, have a tidal source of energy within, created by orbiting their huge central planets and interacting gravitationally with other moons. Pluto is bereft of such heating, but it's possible that radioactivity in its interior could be keeping the inside liquid, Summers said. "These are the things you need for life: organics, raw material and energy," Summers said. While it's a stretch right now to say Pluto is hospitable for life, Summers said he is looking forward to doing more modeling. 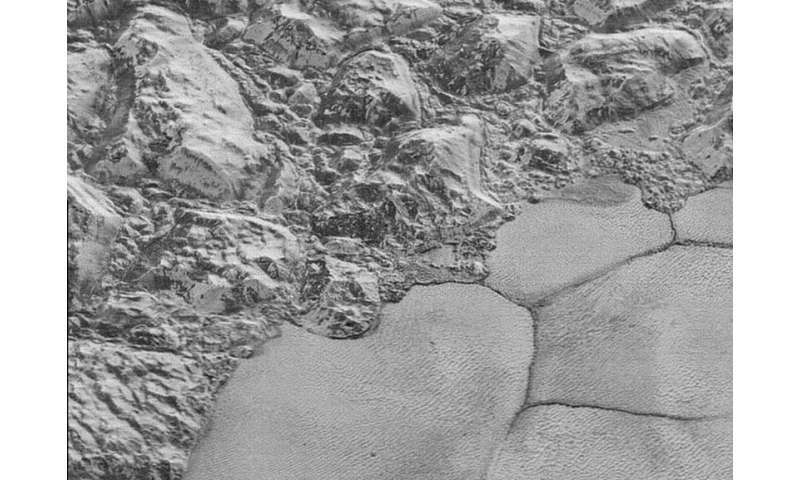 "I've been studying Pluto all my life, and never expected to talk about these things being there."